Fjord is 9 years old and prone to wild imagination which can translate to hypochondria. This time there really was a wolf, when he cried wolf and it bit (well a tick bit but that doesn’t work with the word play). Several days before showing symptoms of tick bite fever Fjord said that his belly button was infected. I told him very irritably that was nonsense and brushed him off. I assumed that he had found a bit of dirt in his belly button and picked at it. I even used the word “crazy”. Over the next few days his belly button became very raw and inflamed. I was cross with him and told him that he had now created a real infection from fiddling and scratching (lovely Mum, aren’t I?) Days later when I took the time to talk and listen, I asked why he had thought it was infected and he said that it was itchy and there had been a sort of insect bite with a bit of pus, this must have been the head of a tick bite. He sometimes walked half bent over and I told him to stop being silly and walk properly. For more than 3 weeks Fjord had a cough, this had nothing to do with the tick bite fever but when he first developed a fever we thought that it was related to the cold and cough which he had been fighting. His immune system was compromised due to insufficient sleep, exam stress and the cough. He complained of a slight headache, felt dizzy, had a sore throat and was sensitive to light. 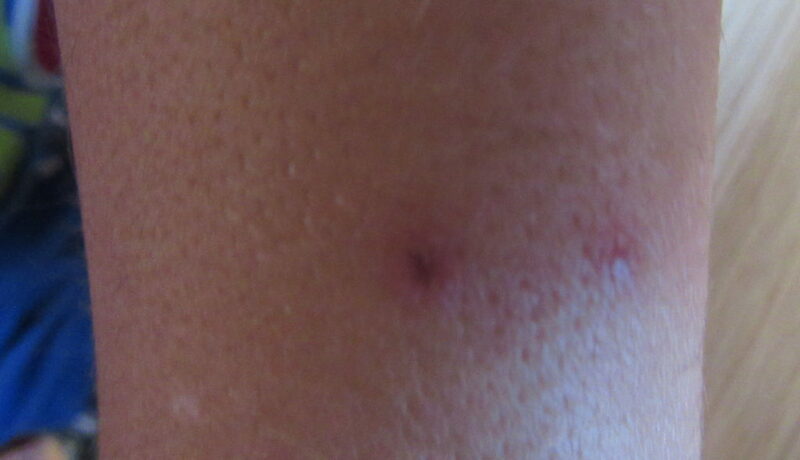 the pimple like spots which formed a random rash on different parts of his body, mainly legs, arms and face. We really started to worry when he was hardly able to get up from bed for a full day. The sore on his belly button seemed more inflamed and about 12 other spots appeared randomly on his body (followed by more the next day). We thought that this rash was now a strep infection which he had spread by picking at his infected belly button then touching other parts of his body. Cliff took him to hospital emergency rooms and he came home without a clear diagnosis and a penicillin antibiotic prescribed with pain and fever meds. At the hospital when the doctor looked at the belly button she asked if he had been in an area where ticks are found. Forgetting that we had spent the night in Dinokeng, Cliff said no. Two days later Fjord was no better, his temperature suddenly spiked to 40°C and he seemed delirious, speaking in a broken confused way. We returned to the hospital. This time possible tick exposure was mentioned and the doctor noticed very swollen lymph glands in his groin. (Fjord had mentioned bumps like “extra bones” in that area and we fobbed it off as another imaginary paranoia without even bothering to look, better give those parenting awards to other folk). Blood tests confirmed tick bite fever. His antibiotic was changed to Doxycyl. Within 24 hours there was a dramatic improvement. PS – As a strange aside, my niece who lives in Durban was in Mocambique a week ago and was diagnosed with tick bite fever yesterday. Quite odd that 2 cousins who visited very different areas in the bush both have tick bite fever for the first time at the same time. Shame Sula, sorry he is so Ill and don’t be too harsh on yourself. It is not easy and sometimes the Wolf is real the very time we don’t fall for it. I think many moms would do exactly the same as you did, don’t be too hard on yourself. Thank you for sharing your story.